it's partly due to our desire to reduce the range of not road legal kits and partly because we don't make any money from BBS02 sales. The failure rate of controllers on the BBS02B is something like 3-4 times that on the BBS01B. Internal controllers on CD kits are fragile, coupled to freely available programming kit for the BBSes multiplies the commercial risk. I made the point of stop digging when you are in a hole a long time ago. Thanks Andy/Tony for this, that makes a lot of sense. So the BBS01B has an external controller? I presume that is the one contained in the battery casing. You have said with my integrated brake/gearshift combo the Bafang is more difficult to fit but the Tongsheng is easier, how does that work?----Maybe I should be asking this directly to you on emails rather than on this forum. There are some very active modding sites for the Tongsheng too, I don't know if I will be able to resist the temptation to meddle with the electronics if I get a kit from you though! With regard to after sales service, I definitely will not be getting a kit from Pswpower, there are too many disgruntled pedelecers with after-sales problems from them. Having said that, I thought I would be safe buying a UK made (from Chinese bits)bike from Freego in Southampton, and now they have just gone into liquidation, so no after-sales service there either. Not that I'm saying Whoosh would go the same way-at least I hope not! it's still nice to have the kit with standard 5-bolt BCD ring system. How many crank drives in the market that you know having this capacity? this is before the low weight advantage of the TSDZ2 compared to Bafang CD kits. it's too early days for me to shout praises for the Tongsheng kit, but I have to say this, from my experience, the Tongsheng LCD is better designed, smarter programmed, the wiring system is as neat as you would find on a German bike, the torque sensor system makes it ride much like a German bike, the optional throttle system makes it better, more versatile than German bikes and last but not least, it's hell a lot easier to service than German CD motors. What is the chainline like - I mean in the sense can one use a normal front derailleur mount? BBS01 has internal controller in the motor casing. Lots to read on the TSDZ2 drive here. I have not fitted the double ring yet, it's somewhere in my workshop but didn't look for it. I just dropped the motor in like a customer would into my Giant Defy test bike, it still has the factory supplied single ring and the chainline is centred on gear No 5 of my 8-speed test road bike, pretty much the same with the previous Shimano crankset that I took out. BTW, the thread run over 168 pages since April 2016, along time ago. Lots of posts in there are no longer applicable. You should post your questions on this forum. Slight hijack - Woosh I have a Yosepower kit which has a 36v hailong battery with an integrated Kt controller. If I was to purchase your GSM CD motor would it work with this integrated controller? I'm thinking about converting my mountain bike and I think mid drive will give me more low end torque for off road (through use of the gears), than I would get with the Yosepower hub motor. I havn't read it myself and I wasn't suggesting reading the whole thing , just thought the more recent posts might hold some real time experiences from other users. the guys on ES have never worried much about sticking to 15.5mph. I'm still humming and hahhing... I would like the certainty of the Bafang as against the unknown quantity of the Tongsheng kit, but Andy and Tony at Whoosh seem to think it will suffice for my purpose. They are better equipped than most to advise, and I believe they are genuine in their advice, not driven by what makes the most profit for them. They would not be so active on here and so well respected here if that were the case. They only seem to do the earlier Bafang stuff, there seems to be no BBs02 kit from them, and no hd kit either. If I was to go for the Bafang I would plump for the hd kit as if I am getting an off-road only kit I may as well get one that does the job and more. That leads to a quandary with after-sales-service, my original concern and why I started this topic. I seem to be going round in circles!!! If the TSDZ @48V is anything like my Yose hub @48V then in assist 5 it should make hills easy. Albeit my Yose can do 20a and the few hill climbs around me 10 -17% for about 500yds I can do at between 7.5 - 10mph with little more then gentle pedalling, the TSDZ should give more as it is torque sensing. Hubs are cadence so even if you give it the beans they don't multiply effort like torque drives. I have been toying with getting the BMSB torque drive KT kit for my hub to try but the shipping kills it as it is 1/2 the cost of the kit alone. PSWPower after sales service is terrible, it seems to be one Chinese lady who's job is mainly to deal with complaints by putting them off and questioning PSWPowers liability. I bought A 350w TSDZ kit from them after reading about PSWPower being a reputable Chinese company to deal with and when i received the kit i fitted it and then found the LCD display was faulty. I couldn't access the part of the menu That sets wheel size, MPH or KPH etc and when i complained(nicely of course) the response was very hostile, first it was my fault and i wasn't doing it right, so i had to send her a photo of the LCD and the error code it generated, i hadn't connected it right was the next excuse, FFS how can you connect one connection wrong. I requested a replacement at which point she said she had to consult the engineers at the factory. So far this had taken a month because i learnt very quickly that you have to be very precise in your emails to her and keep sentences very short and to the point and she would then take several days to a week before sending the reply. Eventually after about another 6 or 7 photos taken at the request of the factory, they asked me to return it at my expense which i did but i was not happy i can tell you. They replaced it quite quickly after getting the defective LCD display, it only took about 3 weeks all told BUT it arrived broken, one of the nubbs that allow the display to swivel was snapped off and it was not repairable, Trust me if i could have repaired it I would have and i'm quite a handy guy, so after more Emails and photo's etc, my patience was exhausted at this point and i got quite cross(to no avail), they eventually agreed the return of the broken display(another £10 postage).Weeks later i got the replacement, it wasn't broken, but i dont know if it worked or not because they sent one with the wrong size lead. If you get the model with the brakes its a larger connector than the non brake version. As you can imagine i was absolutely fuming, but you have to bite your tongue as the girl you are dealing with is only an employee and doing what she see's as her job, Anyway to cut a long story short, i refused to pay any more postage and they sent me the correct display with the correct lead and everything is fine now(i reinforced the nubbs with epoxy as insurance against them breaking), it only took five and a half months all told. I deal with Chinese companies all the time and find them both courteous and accommodating especially when it come to saving me import charges etc BUT PSWPower is the worst by a very long chalk that i have had to deal with. Thank you for this post, I had pretty much decided now to go with a Whoosh kit, but this post has nailed it for me. This post from Whiteturbo confirms my suspicions formed from reading other threads in lots of forums about this Chinese company. Thank you to everyone who have offered their helpful suggestions for me, I will report back here when I get the kit from Whoosh and fit it. You can use the GSM but buy the motor without controller an option on the Woosh mid drive page. Thanks Nealh - do you know if the connectors will fit without modification? the motor connector will fit standard 9-pin that your KT controller uses. There is a common problem running KT controllers with the GSM. It's fiddly to get the parameter for the pedal sensor right. The GSM comes with a 4-pin PAS connector with two sets of Hall sensors. The KT only needs one, so you can cap the unused pin (there is a breakout cable for this) but even so, sometimes the KT interprets the signal wrongly. After you set it to have the motor starting when pedaling normally, it also starts the motor sometimes when turning the pedals backward at certain speed. In that case, the best solution if to fit an external magnet disc to the left hand side. AK runs a gsm with KT, hopefully he can answer any queries ! I think AWOL uses also an external magnet disc with his. I use external because I managed to fry the internal one (learning experience - don't plug things in in the dark when you are tired/impatient). I recently found a replacement PAS board for the BBS0x which looks like it might work in the GSM. I want to go back to internal PAS because I want to clean things up when I move the motor to the trike. Even with the external KT brand PAS and the correct settings on the LCD for KT 12 magnet V2 PAS it will occasionally start the motor if back pedalling when the bike is stationary i.e. no reading from the speed sensor. I guess this might be a bug in the firmware? You do back pedal on an upright to get the pedals in the right position for takeoff at the lights. Riding the trike is different and the PAS kicking in when back pedalling is less of an issue - you don't want to back pedal on a trike! Even at the lights and as your feet are clipped in all the time positioning the pedals is less of an issue. I hope my reply gives the complete picture? The kit arrived and I had real difficulty removing the bottom bracket. 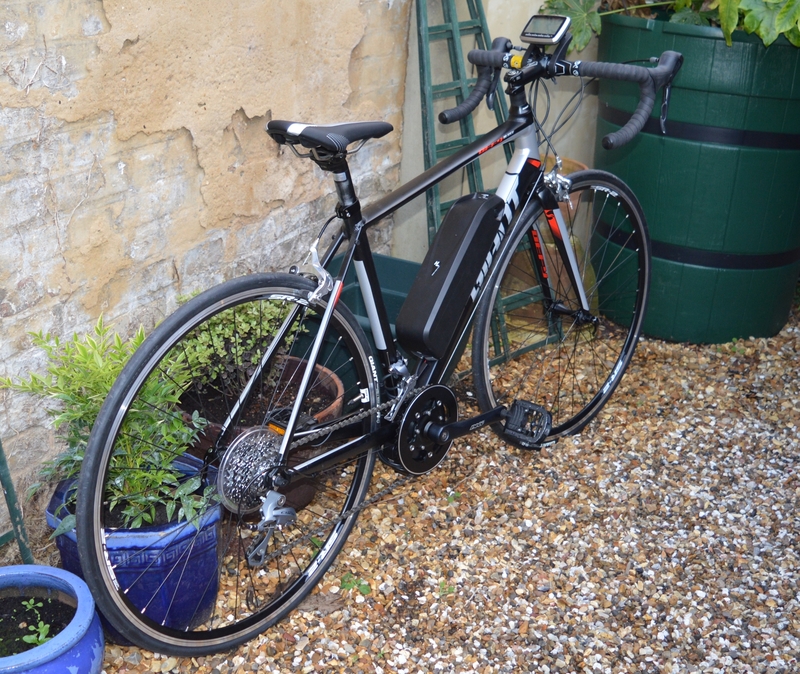 I eventually gave up after contemplating my large lump hammer on the bench and took it to the local bike shop. They had to employ a boilermaker's 3ft spanner to shift it after heating/cooling the bracket, eventually they shifted it. I decided it may be prudent to get them to fit the motor while it was there. The only other difficulty was the gap between the bottom bracket and the motor housing is about 3mm. This is a crucial measurement and is not highlighted anywhere on any site I have seen, least of all Whoosh! The technical drawings supplied do not even show this most important distance-it defies belief. The guide for the rear gearset is attached to all standard bike's bottom bracket here and most are well over 5mm, mine was almost 15mm. 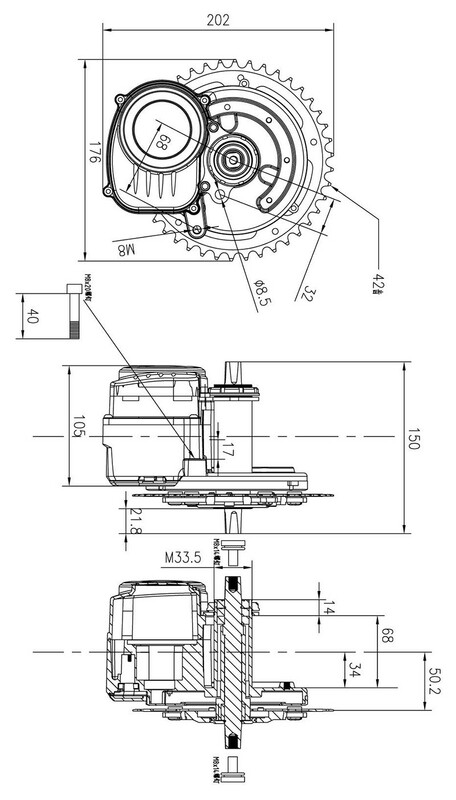 There is no way the motor would slide into the bottom bracket housing with this guide. The bike mechanic tried 3 different guides, all had much too high a profile to allow the motor to slide into the bottom bracket. In the end, he said lose the guide altogether, let the bottom bracket decide where the cable goes and we will just hope for the best. Not a very satisfactory outcome, I'm a firm believer in the manufacturer knowing more than I, they do not fit extra parts for the sake of it. and a series of pictures of the finished article. There are more pictures but this forum has a 10 picture limit per post. I'll put the rest in a separate new post. some pictures of the 16.5kgs STDZ2 test bike. One word of warning: if you have cable guide under the bottom bracket like on this Giant, it'll be a little fiddly to fit. Take the rear wheel off before fitting the motor. Like the BBS01B, the TSDZ2 will fit bottom brackets whose shell is 68mm or 73mm long. However, the space between the motor's bottom bracket and the motor's housing may not be enough to accomodate your cable guide. If your bike has one mounted under the bottom bracket shell, please email us a picture for advice. Also, if your bike has a side kickstand mounted close to or right behind the bottom bracket, please email us a picture for advice.